Heugh's Canyon Waterfall is a canyon is situated between Big Cottonwood Canyon and Mt. 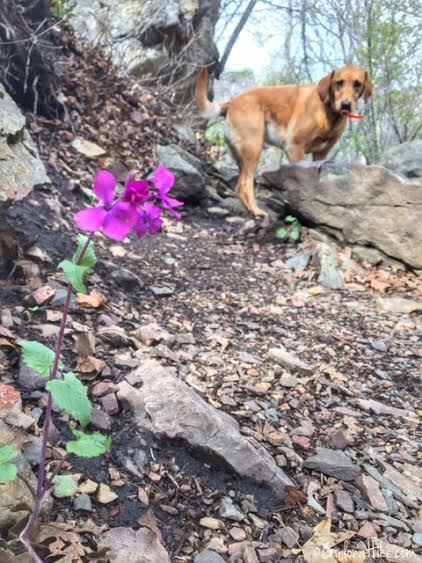 Olympus, making this a dog friendly hike. 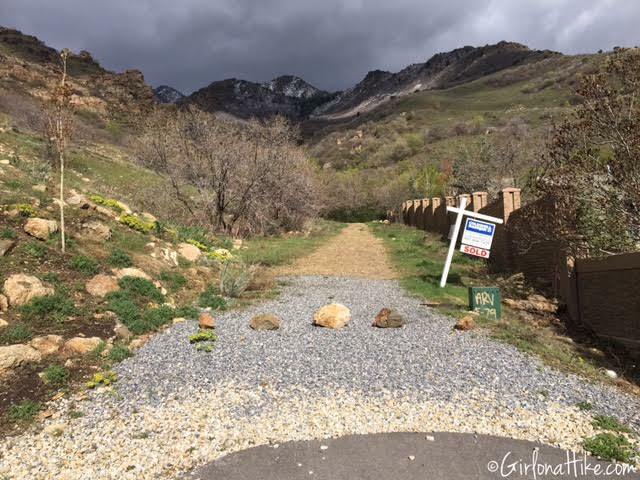 The trail starts from the elite Cove Canyon neighborhood on the East side on Wasatch Blvd. It's my new favorite after work hike. It's very forested (not what you think of if you've hiked Mt. 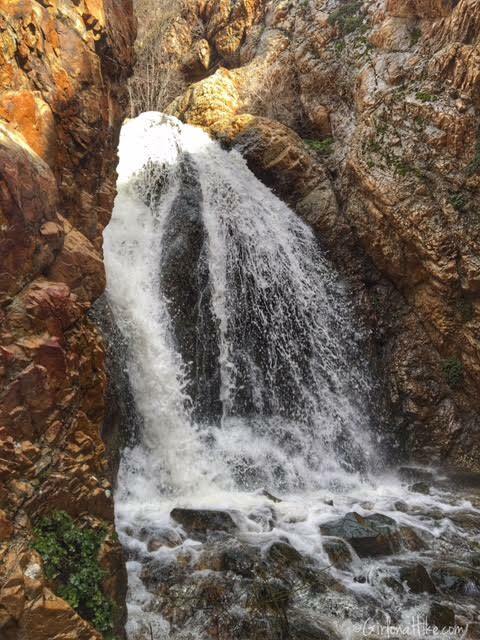 Olympus), it follows Heugh's Creek, in Spring several flowers are blooming, and it leads to a gorgeous waterfall. 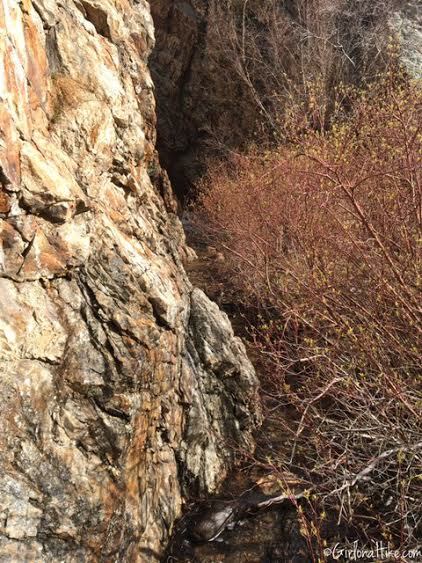 At only a few minutes from SLC, this canyon makes you feel like you are in the Pacific Northwest, away from the city bustle. At only 2 miles round trip, kids and families visiting would even enjoy this hike. Head south on Wasatch Blvd from 4500 South. Park along Wasatch Blvd roughly at 3418 Wasatch Blvd, on the East side of the road where there is a dirt pullout. Park here, as no public parking is allowed in the neighborhood. Begin walking to the actual TH. 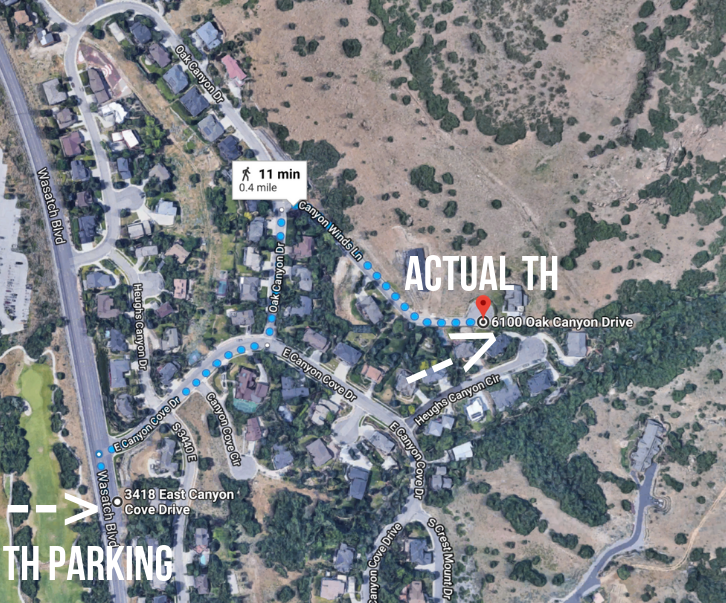 Walk up Canyon Cove Drive, then an immediate left turn onto Oak Canyon Drive, then right on Canyon Winds Lane. From here, awkwardly cut through a neighbor's driveway to get to the dirt trail. There are no official signs. See map below. 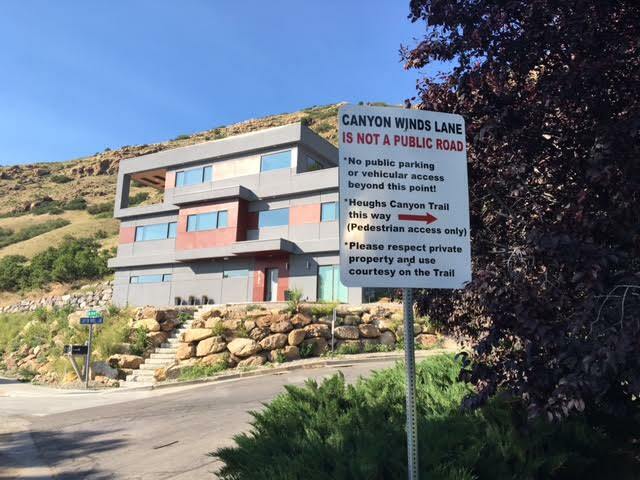 Parking has moved locations for the Heugh's Canyon TH. Here's where you need to park, then walk up. New parking location - this adds on 0.4 miles before reaching the actual TH, making this 1.4 miles each way to reach the waterfall. 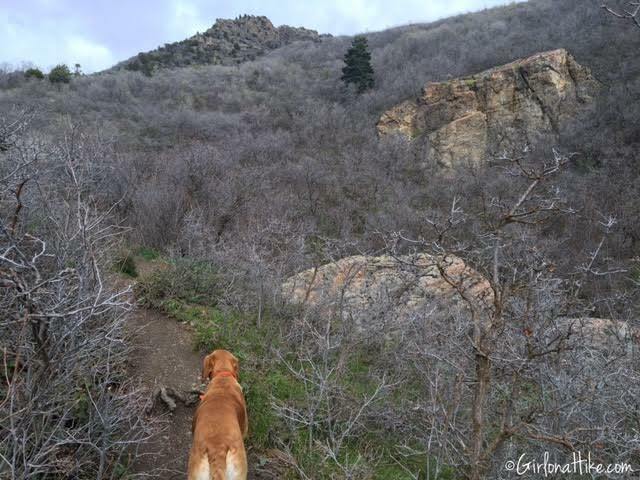 Keep in mind that dogs need to remain on leash until you reach the dirt trail. A sign that is sometimes there, sometimes not. Not sure why it keeps disappearing. Turn right here. Walk up the private road. 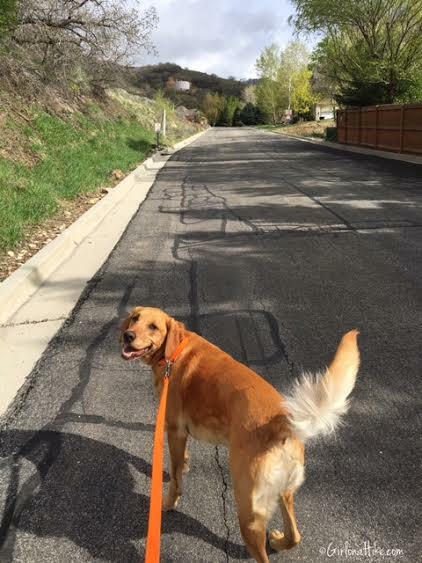 Charlie knows we are about to hike - he's giving me that certain smile. 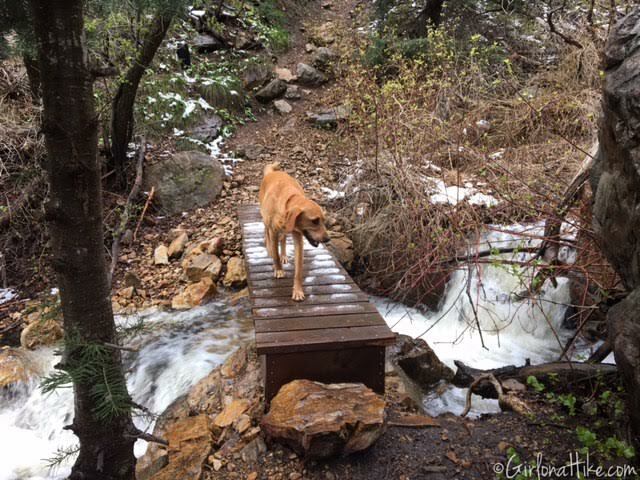 Dogs need to be leased on the road, but are allowed off leash once on the trail. Cut across the neighbor's drive way to the dirt path. This is where the trail starts, but you won't see any official TH signs. As you walk up the trail in the first few minutes you will hear the rush of Heugh's Stream. 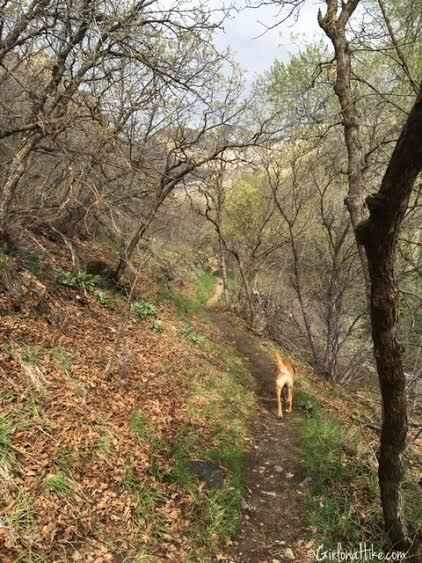 The trail starts out in lower shrub coverage, and immediately starts to gain elevation. 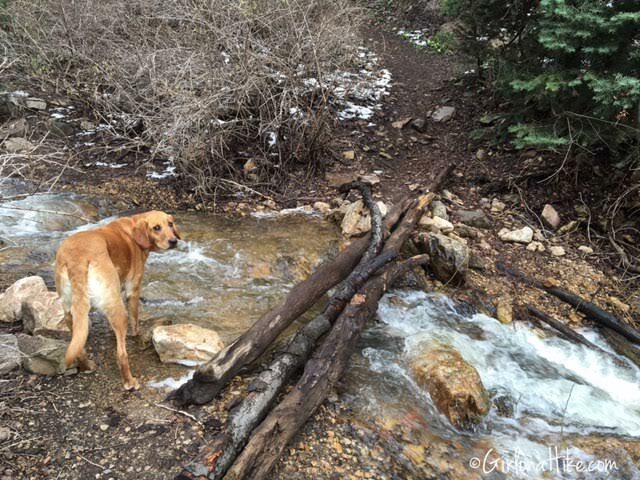 This is a great hike for dogs since they can drink out of the stream. Please be a responsible dog parent and bring doggie poop bags with you (and carry them out!). Several flowers were blooming. My best guess on this purple flower is an Annual Honesty. 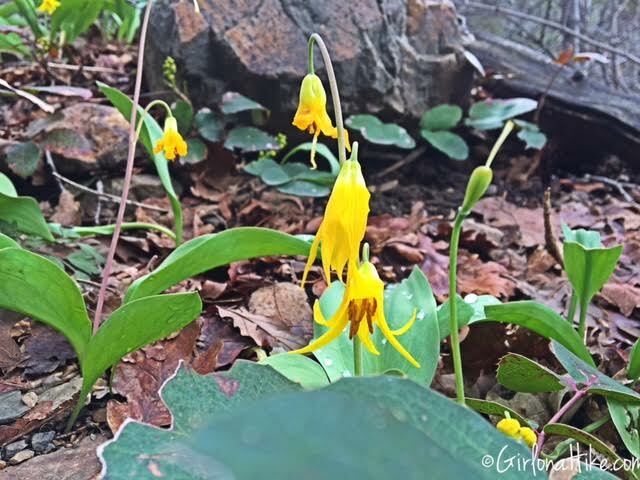 There were TONS of yellow Glacier Lilies. 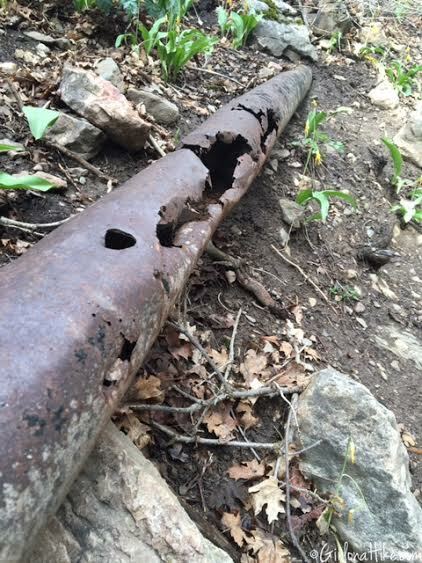 Remnants of the old water pipe can still be seen. The trail started to open up a little. Cross the first stick bridge. 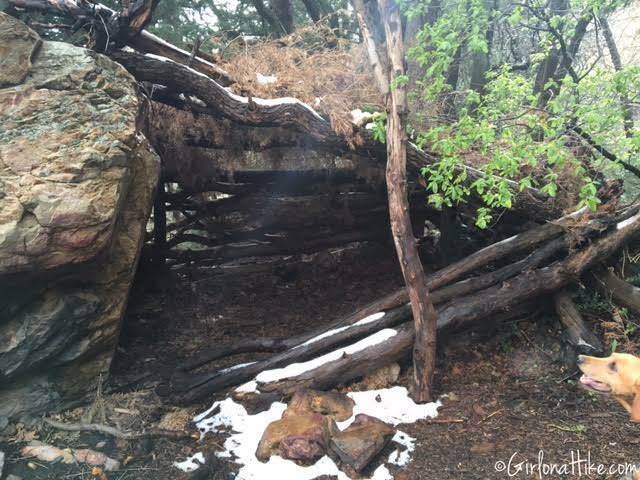 About 3/4 of the way to Heugh's Canyon Waterfall, you will see this old structure. I can't tell how long it's been there, but it looks like it's been used not too long ago. Cross the 2nd bridge. Right after this bridge, the trail gets even steeper. 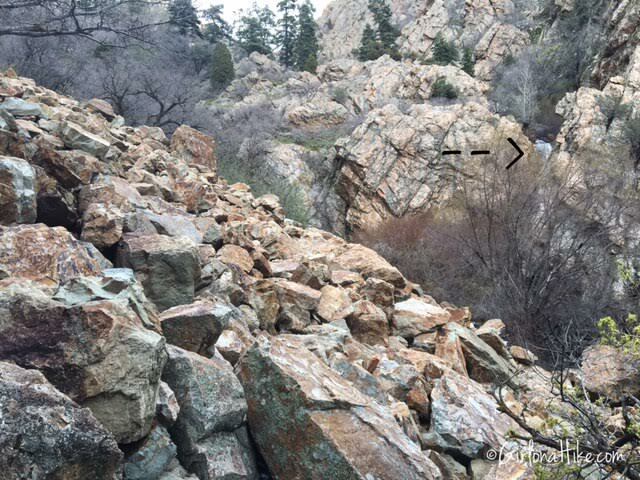 Once you get to the boulder field, look to your right (where my arrow is pointing) and you can start to see the top of the falls. 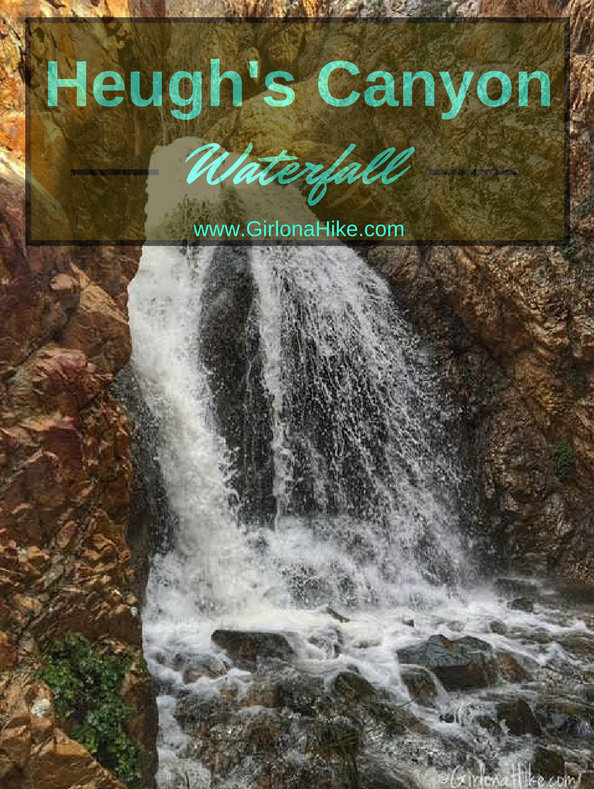 Heugh's Canyon Waterfalls looks cool from a distance, but you can also get to the base of it. Simply cut down and across the boulder field, to the left of the falls. Be careful on which rocks you step on - they aren't always in a solid position. After a rain, they may be slippery too. Once at the bottom of the boulder field, just follow along this rock wall. If you hike here after a big rainstorm (as I did), there's no place to step on that will keep you dry. Either bring water shoes or be ok with your hiking shoes getting wet. I fell in twice, but thankfully my Salomon Speedcross 3's dry pretty quick. I also recommend bringing a waterproof phone case. I dropped my iPhone while trying to take a selfie with Charlie. Thankfully I had my OtterBox on and nothing was damaged, but it did need time to dry out the auxiliary insert. At the base of the falls. It was raging! 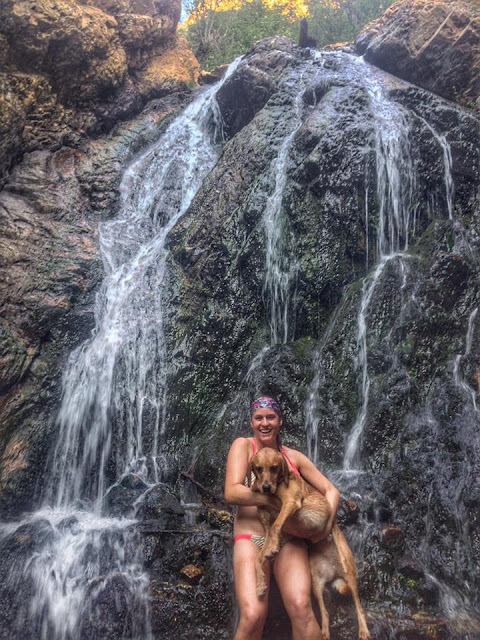 A few months later (June) when the waterfall had slowed down - we hiked up in our swimsuits and played in the falls! Just be careful the rock was really slippery. 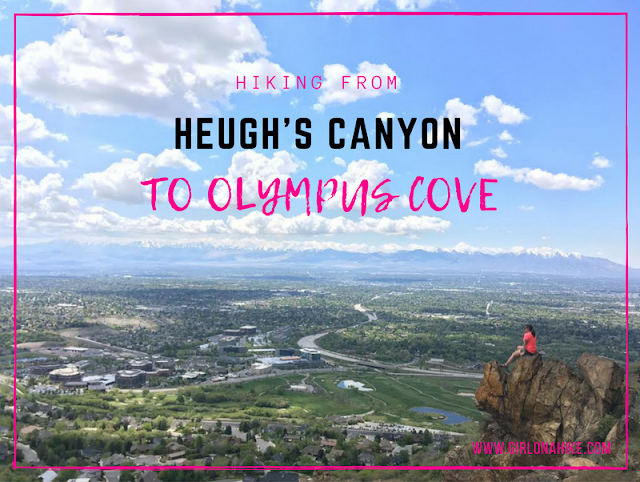 Heugh's is also a great winter hike! Heugh's Canyon Waterfall trail map. You can see that the trail cuts over the boulder field, then over to the waterfalls. OH no!!!!! I am so sorry your phone went swimming! Glad it survived! Thanks for all the great info can't wait to check this trail out! I have never heard of this trail. Thank you for the info. I especially appreciate the pictures of the parking and trailhead - so helpful. If you stay to the left and slightly up as you cross the boulders the trail goes on, passing a very nice little falls, essentuall above the one you described. I just hike up Heughs Canyon for the first time yesterday 5/21/2016. The leaves are all out since you were there and it is really lush and green. I turned around at the first waterfall. Thanks for the post with the map. Thank you so much for posting this! We did it and we both loved every minute of it! (well, maybe not crossing the boulder field) but the rest! Definitely my new favorite spring hike! You have been giving me a lot of new places to go, so Thank you for that! 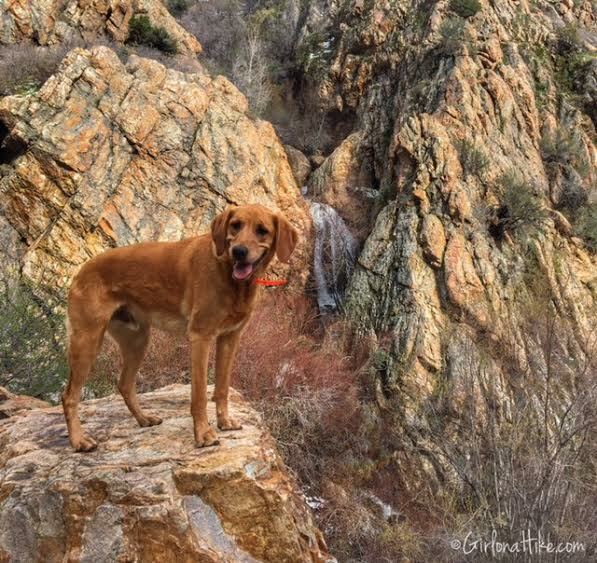 Thank you for sharing this hike and all the directions info especially. I'll be checking it out Saturday! Alicia-- just went, and it was awesome! Beautiful trail, great shade, beautiful waterfall. Already plan on going back in the middle of July when it's nice and toasty because the waterfall will be so fun to play in. ** FYI: *** The second sign marking the trailhead has been removed, but your Picture of the funky modern maroon and gray house helped us find the trailhead anyway. Thank you so much! went up and explored the area. didnt find the waterfall. :( do you happen to have the GPS coordinates of the fall? Did this trail this weekend (July 23rd) just out curiosity. Definitely not best done in 100 degree heat, but it was tolerable all the way up due to intermittent shade. 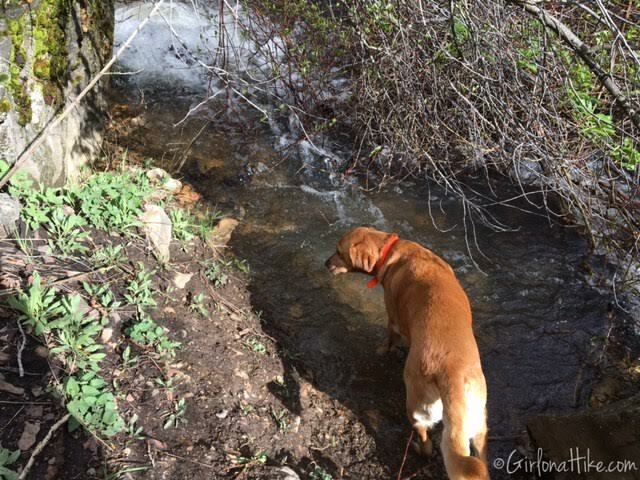 The stream runs on and off the whole way, so there's water for the dog. Also, the waterfall was still running, even at this time of year. Thanks! This was a really fun hike. I love your interactive map. I was thinking the same thing! Yes, thank you very much for the detailed instructions and photos. SOOOO helpful! Don’t know what I’d do without your blog and explanations/photos. Never would have found this! Have tried to find the trailhead forever, let alone the falls cuz I didn’t even know there WERE Falls! It sure seemed like longer than 1 mile up? My Strava and Fitbit both said about 4 miles total? Also, I braved the boulder field and found the cairns (thank heavens!) and my dog couldn’t make it! I’ll try again sometime. Like someone already said, the TH signs have been removed I think and thanks to your photo of the kooky modern block-ish house, we could tell where to park! Thank you!!!! Just went today and the waterfall was very small but I still enjoyed it. Also, I encountered a rattlesnake in the boulders so be careful! I also wouldn’t recommend this for small dogs as the boulder field can be too hard for them. I loved the hike but will say the waterfall level was low this year too. I also encountered a rattlesnake by the boulders so be careful!! Just an FYI, in the summer, you’re sure to encounter a rattlesnake. 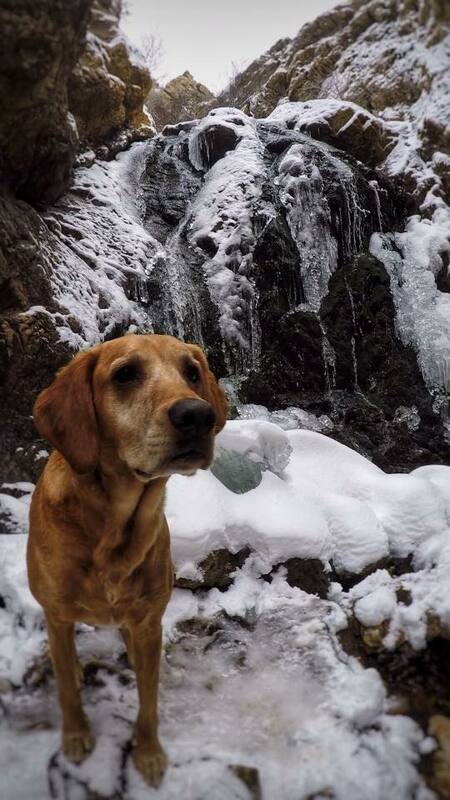 Is venturing to the waterfall scary in the winter when you have to cross snow covered boulders/rocks? Not really, as long as you go slow and watch your step. Microspikes might be helpful if it's only icy. I love it in winter so - pretty!